Instructions for basic arithmetic operations with a rotary pinwheel calculator. This is a new article and was not in "The International Calculator Collector". Carriage - Can be moved to the right and left. Setting Register with Setting Levers - These are used for entering the number with which a calculation is to be performed. Product or Result Register - Where the results of additions, subtractions, and multiplications appear. Revolution or Quotient Register - Counts the revolutions of the crank handle and registers the results of divisions. Clearing Crank for Product Register - Turning it clears the product register to zero. Clearing Crank for Counting Register - Turning it clears the counting register to zero. Carriage Release Key - Pressing it releases the carriage, allowing it to be pushed to the right and the left. Left Carriage Movement Key - Pressing it indexes the carriage one decade to the left. Right Carriage Movement Key - Pressing it indexes the carriage one decade to the right. Decimal Indicators - Used for marking off decimals in all registers. These greatly help correctly reading the registers. Operating Crank Handle - To turn the crank handle, pull it out to the right and make quick, even revolutions. Before completion of the last revolution, release the handle, allowing it to fall back towards the machine and enter its catch, so preventing further movement. Always complete turning the crank handle a full revolution; do not start turning the other way part way through a revoultion otherwise there is danger of jamming the mechanism. If you turn the handle too far continue to its rest point, then turning a full revolution in the opposite direction will undo the extra revolution. Return the crank handle to its rest position before adjusting anything else, otherwise there is a danger of jamming the mechanism. Turning the crank handle clockwise adds the number set in the setting register to the product register and increments the counting register by 1. Turning the crank handle counter-clockwise subtracts the number set in the setting register from the product register and decrements the counting register by 1. Basic method of operation - When one of the setting levers is moved to a number then that number of pins is raised on the corresponding pin-wheel (ie. moving a lever to '7' raises 7 pins), see the photograph below. Turning the crank handle clockwise rotates all the pin-wheels. The raised pins act as gear teeth and advance the individual product register wheels by the number of pins, so adding the set number to the product register. 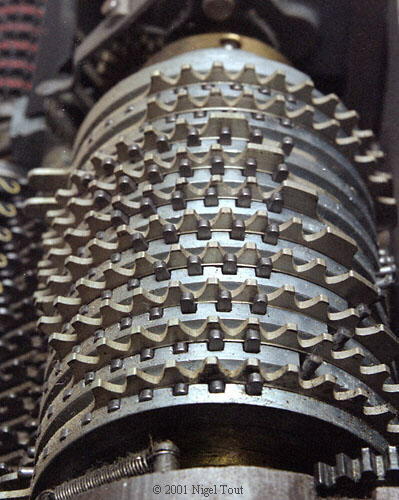 Close up with the cover off, showing the pin wheels from the right with the number of pins raised on each wheel depending on the number set by each lever (from top to bottom 0087654321). These act as gear teeth when the crank handle is turned. The following instructions are taken from the operating manual for a Muldivo Mentor but apply to most models. Shift the carriage completely to the left. Set 43, pulling down lever 2 to 4 and lever 1 to 3. Turn the crank handle once clockwise. Change the levers from 43 to 376. Give another clockwise turn of the crank. The result shows in the product register. The 2 which has appeared in the revolution register indicates that two numbers have been added. Here the decimal indicators come in handy. They should be set at the beginning of an addition both in the setting and the result registers. Take care that the units, tens etc. are always set in the same column. The number 24, for example, must be set accordingly with levers 5 and 4. Shift carriage completely to left. Set with levers 6 to 1, setting decimal indicator in setting register between decades 2 and 3. One clockwise turn of the crank handle. Change 2376.35 to 1953.03. Turn crank handle once counter-clockwise. The result appears in the product register. This is the standard method of performing multiplication. Shift carriage completely to left. Set 6 with lever 1. Three clockwise turns. The answer appears in the product register, in positions 1 and 2. The revolution register indicates the multiplier 3. When multiplying 6 by 33, it is not necessary to turn the crank handle 33 times. After three turns with the carriage in position 1, move the carriage to second or tens position by pressing the right carriage movement key, then make three more clockwise turns. Note that this is not the best way of carrying out this example.When doing multiplications with numbers of several digits always be sure to set the larger number of the two and multiply by the smaller, or more exactly the one requiring the lesser number of rotations. This is the basic method of division by subtraction. Note that the registers have a slightly different usage. Shift carriage as far to the right as it will go. Set the dividend 147 in the setting register and then transfer it into the result register by one clockwise turn of the crank handle. Note that for division the result appears in the revolution or quotient register, not the result register. Do not forget to clear the 1 which appears in the revolution register. Using the setting levers set the divisor in the correct decades by clearing the 1 to 0 and replacing the 47 by 12. The machine now counts how many times 12 can be subtracted from 147. The result, the quotient, will appear in the quotient register. You now start dividing by turning counter-clockwise, subtracting from the result register which reduces down towards zero until it goes past zero and 9s appear in the highest decades. Usually this causes a bell to ring. The bell signal means that you have made one counter-clockwise rotation too many, which must be corrected by turning the crank handle once the opposite way to clear the 9s in the highest decades. In this example, the bell rings at the second turn. After correcting the over-turn by one clockwise turn, shift the carriage one place to left with the appropriate carriage movement key, and continue subtracting until the bell rings again, when you again compensate for over-turn by one in the opposite direction. Continue in this way until until the problem is solved when the dividend disappears completely from the result register and the quotient register shows the result of the division - 12.25. Other techniques, and shortcuts can be used in certain circumstances, and methods are available for determining square roots. Until the coming of cheap electronic calculators in the 1970s, hundreds of thousands of these calculations were performed daily on this type of machine.